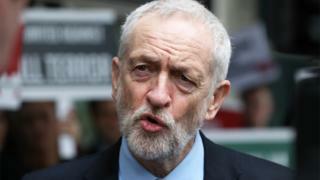 Jeremy Corbyn privately expressed concern that evidence of anti-Semitism within Labour was "mislaid or ignored", leaked recordings suggest. The Sunday Times has released part of a conversation the party leader had with Dame Margaret Hodge, which she taped. The Barking MP told the BBC she made the recording as an "insurance policy". A Labour spokesman said the tape showed Mr Corbyn's desire for "robust and efficient" procedures and to "rebuild trust with the Jewish community". Throughout much of his leadership, Mr Corbyn has been dogged by criticism from within the party about his handling of anti-Semitism claims. Last year he became embroiled in a row with Labour's Dame Margaret over the issue, which saw the party launch - and then drop - disciplinary action against the long-serving Jewish MP. She secretly recorded a conversation between the pair in February, as Mr Corbyn talked over a plan to recruit former cabinet minister Lord Falconer to review the party's complaints process. "Just to reassure you, he's not going to be running the system; he's not entitled to do that," the Labour leader says on the tape, which was given to the Sunday Times. "He will look at the speed of dealing with cases, the administration of them and the collation of the evidence before it's put before appropriate panels... because I was concerned that it was either being mislaid, ignored or not used, and there had to be some better system." Speaking on BBC Radio 4's Sunday morning programme, Dame Margaret, who has been a fierce critic of Mr Corbyn's stance on anti-Semitism, said: "I think it reflects a complete breakdown of trust between people like me and the leader of the Labour party. "The reason, actually, that I recorded that particular tape was as an insurance policy. "I was having a one-to-one meeting with Jeremy Corbyn and ironically I didn't want what I said to be misrepresented so I thought it was best to record it." She added that a newspaper article days later, reportedly based on leaked internal documents, contradicted what the Labour leader had said during their taped conversation and led her to believe "either he [Mr Corbyn] was lying or he was being lied to". In March, Dame Margaret claimed Mr Corbyn had misled her - or been misled by his staff - over assurances the leader's office was not involved in disciplinary procedures. Labour dismissed the suggestion as "categorically untrue". Last week, the Jewish Labour Movement voted to pass a motion of no confidence in the Labour leader. Its national secretary Peter Mason said reports of delays, inaction and interference from the leader's office showed the party's processes were "incapable of dealing with anti-Jewish racism". Dame Margaret is among seven Labour MPs to write to the Sunday Times this weekend, calling for a "fully independent body" to deal with complaints of racism, harassment and bullying. They complain of "a growing backlog of unresolved cases of vile racism". "Despite telling us things are better, the party has clearly failed to get to grips with its anti-Semitism problem," the letter says. "The current complaints system is broken. There must be a real change at the top of the party." Dame Margaret told the BBC an independent system would restore confidence in Labour. David Lammy, Labour MP for Tottenham, also backed the call, telling the BBC's Andrew Marr Show there had been a "failure of leadership" within the party. A Labour spokesman said: "Jeremy Corbyn was referring to concerns about longstanding, inherited procedures and expressed his commitment to make them as robust and efficient as possible and to rebuild trust with the Jewish community - which is the right thing to do." A party source told the BBC that before Jennie Formby became general secretary a year ago, there had been concerns that Jewish activists not in breach of rules were targeted, while efforts to tackle clear cut cases of anti-Semitism were obstructed.